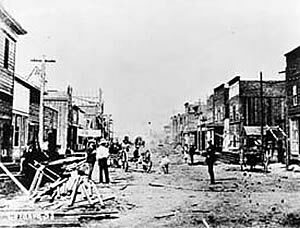 The city of Vancouver (formerly known as the town of Granville) was incorporated on April 6, 1886. Two months later, on Sunday, June 13, clearing fires in the English Bay area were blown out of control by a sudden storm and the newborn city was destroyed. The Regina Hotel on Cordova Street, two sawmills and a few shacks on the outskirts were the only buildings left standing. On the following morning, building activity started, and by Wednesday afternoon, a three storey hotel was open for business. Within a month, fourteen hotels and hundreds of buildings were erected. Many, as in the pre-fire period, were built of wood, but a good number were also built of brick or granite. A new city by-law required buildings to be more solidly built, and the Terminus Hotel on Water St was one of the first masonry buildings. The construction boom continued until 1893, with the main area of commercial activity occurring in the Gastown area. In July, 1886, the foundations were laid for the first CPR Hotel Vancouver on Georgia and Granville, and the second storey was completed by December. The Hotel officially opened on May 16, 1887 (the second Hotel Vancouver replaced that building in 1916) and a week later, the first CPR passenger train arrived from Montreal. In August, the first electric lights were turned on, generated by a 25 horsepower, steam operated generator near Abbot and Pender Streets. By the end of the year, the population was 5,000. In 1888, the first hospital, a wood framed structure with a capacity of 35 beds, was opened on the corner of Beatty and Cambie. The Same year saw another memorable event – the official opening of Stanley Park. By the beginning of 1889, the population of the city had increased to 8,000. It was the year when the history of the carpenters’ union was first recorded. In that first two and a half years following the fire, building tradesmen arrived in great number from all over North America and the British Isles. The tradesmen from Britain had a background in union activity and a branch of the Amalgamated Society of Carpenters and Joiners of Great Britain was chartered. The Amalgamated Carpenters went on a two month strike for a nine hour day. The strike was won, but internal union problems followed, and a number of members broke away and applied to the United Brotherhood of Carpenters and Joiners for a charter. There were other highlights during the birth years of the carpenters’ locals. Construction was started on the Opera House (across Georgia St. from the Hotel Vancouver). The first electric street cars went into service and the first Granville St bridge, a wooden-built trestle, was opened. The first water from Capilano River was piped across the First Narrows. By the end of 1890, the population had grown to nearly 14,000. The first organization of carpenters in Vancouver was a local of the Amalgamated Society of Carpenters established in 1889. Apparently a local organization of shipwrights was also in existence at this time. An organizing committee was set up by the meeting headed by Joseph Dixon, a carpenter. 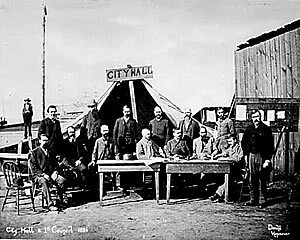 In January, 1890, the Vancouver Trades and Labour Council was set up on a per capita basis. Joe Dixon was elected president. The Vancouver local of the Amalgamated engaged in a successful strike in 1889 for the 9 hour day. However soon after the union split, with a section breaking away to form Local 617 of the Brotherhood in May, 1890. Vancouver at this time was only five years old and had a population of 8,942 males and 4,767 females. On August 21, 1890, the local endorsed a petition from the Trades and Labour Council proclaiming Saturday, Sept. 6 a public holiday to be known as Labour Day. (Note: this was four years before the federal government declared it an official holiday). The local also prepared a banner for the Labour Day procession. On June 18, 1891 the local had 122 members in good standing. On Feb 18 1891, the local began the card system (no union member was permitted to work with a non-union person). On December 3, 1891, the members decided to assess themselves 25 cents a month to pay sick benefits to members at the rate of $5.00 a week. A medical certificate was required. On June 30, 1892, the local criticized the two Vancouver newspapers-the Telegram and the News Advertiser – for their anti-labour reporting. In 1892 it was reported that wages and working conditions were threatened by the CPR using Vancouver as a dumping ground for all types of labour; also that the post office and CPR were working 10 hour day and union members were refusing to work on these jobs. The desire to have some form of organization to represent all Canadian locals of the Brotherhood also arose early in the union’s history. ON Sept. 8, 1904, the local set up a committee to correspond with all Canadian locals of the Brotherhood to pressure the head office to establish a Canadian office. In the spring of 1907 the local went on strike. A joint strike committee was set up with the Amalgamated, consisting of 50 members from each union. The committee met every day except Sunday. Mass meetings of strikers were held regularly and the name of strike breakers were put on a list. Strike pay was 50 cents a day, and working members were assessed 50 cents a day. The head office contributed to strike assistance with cheques of $750 and $1,200. On Dec.22, 1909, the local voted 79-1 in favour of forming a BC Federation of Labour. On Sept 8, 1913, the local voted 30-21 in favour of requesting the Vancouver Trades and Labour Council to recognize May 1 as Labour Day. On April 19, 1911, the local established a strike fund, starting with $500 form the treasury and a 25 cent a day assessment on members. Next month the local was on strike. Strike pay was $4.00 a week. On May 7 about 90 members were reported on the strike roll. Two cheques of $600 and $448 were received from head office for the strike pay. On June 14, three members were fined $25 to $50 for strike-breaking and one expelled. The strike was concluded in July. In September, 1919, locals 617 and 1803 merged to form Local 452. On Nov 9, 1931, the local criticized the American Federation of Labour Convention in Vancouver for refusing to support Unemployment Insurance. By 1937 economic activity began to pick up and most of the local’s members were working at 90 cents an hour. A five days week was in effect on most jobs. (membership had hit a record low of 35 during the worst days of the depression – 1932 and 1933). Foremen were getting $1.00 a day extra. Members got time and half for overtime for the first four hours, then double time including Saturdays and Sundays. Call out time was 2 hours pay; 4 if work had started. They were paid each week. During 1937 and in the following years many ex-members rejoined the local as work became more available. On Oct 25, 1943 the local called for a provincial convention to set up a Provincial Council of Carpenters. On Dec 13, 1954, the Executive of the local recommended that 100 copies of a speech by Colin Cameron, CCF MP, protesting the rearmament of West Germany, and reprinted by the BC Peace Council, be purchased and distributed. The vote was 37-25 for the executive recommendation. Next month on Jan 24, 1955, Brother Woodery laid charges against eight member, including the president, vice-president, warren, recording secretary, two executive members and two business agents. The charges were referred to the District Council. The Feb 14, 1955 meeting was in an uproar. W Page was appointed by the Head Office in the US to take over the local. The March 28, 1955 meeting was again unruly. On April 20, twenty members were suspended from the local and local meetings cancelled until further notice. On August 22, 1955 the General President in the U.S. appointed George Bengough in charge of the local. Membership meetings were resumed, presided over by W Page. This practice was carried on for the next three years, until May 10, 1958. On Sept 9, 1957, Page permitted the local to elect its own officers to the Provincial Council. On Dec 9, 1957, the local requested the lifting of the trusteeship. On Jan 27, 1958 the right to elect its own officers was restored to the local. In April of that year the officers were required to sign an affidavit of loyalty. In 1961 the local began publication of its own paper “On the Level” in mimeographed form. In 1962, unemployment was high and the local supported a trek of unemployed to the legislature in the middle of February organized by the BC Federation of Labour. In June 1964, the union signed a new two year contract which called for a 20 cent wage increase retroactive to Jun 1, a 15 cent increase on April 1, 1965, full room and board anywhere in BC, 3% payment on gross earnings for statutory holidays starting Oct 1, 1964, health and welfare in carpenters’ own plan starting Jan 1, 1965, union hiring and job steward protection. The August issue of “On The Level” noted that “before the expiry date of our 1964-66 agreement, all carpenters in BC will be under the Standard Provincial Agreement, with wages and working conditions the same.” It called this a “First” in Canada. Wages in all areas would be $3.49 per hour by the end of the agreement. Excerpts from “A History of Union Carpenters 1883-1978 Building British Columbia. Copyright November 1979 by Carpenters’ Pensioners Association of British Columbia. In 1995 Locals 452 and 1251 merged to become Local 1995. When Douglas McCarron was elected as General President of the UBCJA in 1995, one of his central election planks was to restructure it. As far as BC was concerned, there was general agreement on the need to restructure the BC union. The dispute between the International and the BC Provincial Council (together with most of its affiliated Local Unions, including Local 1995), centered around the means by which restructuring should take place and what the resulting structure should look like. The International’s restructuring initiative across North America is base on a set of “33 Model Bylaws” that were unveiled in approximately 1996. The model bylaws contemplate the creation of “full service” Regional Councils within British Columbia which would assume most of the assets of, and most of the responsibilities now undertaken in BC by the Provincial Council and Locals. The Provincial Council was immediately advised the “Model Bylaws” being proposed by the International were not open to change. It is the Provincial Council, not the International that has been recognized by the Labour Relations Board as a trade union under the Labour Code of BC. The International, like other international labour organizations, does not enjoy that status in this Province. The International’s restructuring plan in BC contemplated divvying up the powers currently held by the Provincial Council among new Regional Councils, staffed by leadership appointed by McCarron for an unspecified length of time. The top-down reforms, implemented by directives from the International, while the Provincial Council advocates that any proposed reforms be subjected to direct democracy-votes of the members affected. The great majority of the members in BC have been, and continue to be “adamantly opposed to McCarron’s restructuring”. While never spelled out publicly, it was discussed among the International faithful that restructuring in BC was inextricably entwined with breaking the power of the Provincial Council. McCarron has also publicly (Los Angles Times newspaper) stated his disdain for BC leadership, calling them “misguided and incompetent” idealists who are under the influence of the communist party. September 4, 1997, faced with broad opposition from BC members to restructuring, as well as an increasingly strong autonomy movement, the International wasted no time in developing a comprehensive strategy to implement restructuring, break the power base of the Provincial Council, and place supporters in influential positions. The strategy memo demonstrated placing Local 1995 and the Provincial Council under supervision-and was absolutely consistent with the International’s long-term objective of wresting control of the BC union from the elected leadership. Beginning in approximately early 1998, the International and the Provincial Council participated in facilitated negotiations with the former Chair of the LRB. The Facilitation continued on and off until June 1999 when the parties reached an impasse on the issue of restructuring generally. July 1999 a restructuring meeting with Doug McCarron was held in Pt Alberni, BC. That meeting became a demonstration of members’ dissatisfaction (several members of Local 1995 and others BC Locals attended) with McCarron’s plans. The first question addressed to McCarron at the meeting was whether the members would be entitled to vote with respect to his restructuring plans. When McCarron answered “No”, the members shut the lights off and left the meeting. At the April 2000 BC Provincial Council of Carpenters Convention the delegates had passed various resolutions on the subject of autonomy, including a resolution to establish a committee to develop a new Provincial Council Constitution that would reflect principles of autonomy (for this reason, the new Constitution was dubbed the “stand-alone constitution”). Over the next several months, the proposed Constitution was drafted. In the winter of 2000 the Provincial Council decided to conduct a mail-out ballot on the proposed amendments to the BC Provincial Council Constitution and autonomy. Special meetings to discuss the proposed amendments took place at Locals around the Province. The mail-out ballot on the issue of the proposed Constitution amendments and autonomy was conducted in approximately March 2001. The referendum passed with the BC Carpenters union having their own “stand-alone” Constitution. In June 2003, Local 1995 held elections for its officers. The campaign for this election started early in the year. There were two slates of candidates: those who supported the International and those who advocated autonomy. The candidate for Treasurer on the pro-International slate was being paid as an organizer by an International local at the same time as he was running for a position on Local 1995’s Executive and campaigning on job sites. The pro-International candidates failed to obtain the support of the membership and all but four of their candidates were defeated.. These election losses – in the largest local in BC, in an issue based election represented a significant set-back for the International. Local 1995’s supervision hearing, which McCarron later directed represents a second “kick at the can” for the International. There was no reason to expect the International would have any qualms about engaging in such anti-democratic behavior. In 1997, the International rep had “strongly” advocated the International cancel all local elections in BC so as not to permit any further set-backs in achieving the International’s takeover in BC. In late 2003, BC members took significant steps towards obtaining greater autonomy from the International. In the fall of 2003 the Provincial Council conducted a referendum vote of its membership. The question was, “Do you wish to transfer the affiliation of the BC Provincial Council of Carpenters and its affiliated Local Unions from the United Brotherhood of Carpenters and Joiners of America to a Canadian Union? (BC Carpenters have the right under the Code to transfer their bargaining rights to a trade union of their choice.) The International campaigned against the referendum question, while Local 1995 strongly supported it and urged its members to vote “yes.” In December 2003 the results of the referendum were published. The membership voted 82.9% in favour of the referendum question. On November 21, 2003 the Provincial Council formed a joint bargaining council with the Communications Energy and Paperworkers Union (CEP), known as the Construction, Maintenance and Allied Workers Bargaining council (CMAW). A joint bargaining council is a legal means of two separate trade unions to jointly hold bargaining rights. It is stating the obvious that the CMAW, once certified as a trade union would be more autonomous from the International. On Dec 3, 2003 CMAW applied to the Labour Relations Board for certification as a trade union in respect of a particular employer (in effect, the CMAW would be operating as a trade union of carpenters in parallel with the Provincial Council). Local 1995- The Supervision Directive (April 2004) On March 16, 2004, McCarron wrote to Local 1995, alleging it was acting contrary to the welfare of its members. April 8, 2004 McCarron confirmed that he had indeed decided to appoint a hearing committee to hold a hearing regarding the question of whether Local 1995 was acting contrary to the welfare of the members. On April 16 Local 1995 applied to the Labour Relations Board for an interlocutory injunction, which was granted on April 29. The LRB injunction in respect of Local 1995 remained in place until Aug 10 when the Board declined jurisdiction over the matter in favour of having it heard in the Courts. March 2004 – Local 1995 along with other affiliated locals developed their own LINK member database computer system. This system (unlike the UBCJA Ultra computer System) complied with the Personal Information and Privacy Act that was legislated in Jan 1, 2004. Local 1995 had major privacy concerns with the ULTRA system. Members complained about receiving anonymous letters critical of the BC union leadership that appeared to have been distributed according to the ULTRA mailing list. Local 1995 had no control over ULTRA, nor did it have any control over who accessed the information. One reason cited by McCarron for the Local 1995 Trusteeship Directive was that new officers of Local 1995 had not been installed using the installation ceremony in the International Constitution. Officers elected in July 2003 were installed at a membership meeting held that month (almost a year before McCarron issued the Local 1995 Trusteeship Directive). In light of the long and bitter dispute between Local 1995 and the International, and in light of Local 1995’s desire for autonomy, Local 1995’s President at the time drafted an installation ceremony oath that replaced references to the international with references to the Provincial Council. This was regarded as a purely symbolic gesture-whether the International accepts it or not, the Provincial Council holds bargaining rights in BC and it was appropriate to pledge to uphold the Provincial Council Constitution. Local 1907 Chilliwack-Mission disaffiliated from the Provincial Council in 2004. The area covered by Local 1907 was transferred to Local 1995 who now serve Vancouver Lower Mainland, Sunshine Coast, Whistler up to Lillooet.